The resignation of the young, hardworking, honest, patriotic and detribalized immediate past Minister of Finance of the Federal Republic of Nigeria, Kemi Adeosun, was a demonstration of integrity, professionalism and, as she put, “total commitment to a culture of probity and accountability”. Many Nigerians have the feeling that nobody would resign from what some politicians called “juicy post” on account of an allegation that has not been substantiated by a competent court of law. But as honorable as she has been as a minister, she decided to tender her resignation letter to His Excellency, the President of the Federal Republic of Nigeria, the moment she became privy to the findings of the investigation into the allegation made in an online medium that the National Youth Service Corps (NYSC) Certificate of Exemption that she presented during her screening for appointment as minister was not genuine. She could have made a court case against the “trusted associates” that she mistakenly relied on to enquire about her status in respect of the NYSC who, after submitting her application for exemption, brought to her the fake certificate. She had no reason to suspect the certificate since she didn’t know the operational procedures of NYSC on its issuance and she trusted those wicked agents. What a mistake from an innocent and clean-minded person! Mistake (which normally attracts warning and forgiveness) is different from irregularity or fraud (which are intentional and subject to suspension for investigation and dismissal, if found guilty). There is no evidence to show that Adeosun masterminded the process of obtaining the fake certificate; in fact there was no reason for her to seek to get such a fraudulent paper. She was imminently qualified for a favourable decision from the NYSC had it been that she made physical appearance at the NYSC directorate headquarters for the evaluation of her credentials as a foreign trained graduate, who graduated at the age of 22 years, when she was a British citizen, and later obtained Nigerian citizenship and passport at the age of 34 years. Rather than taking any legal action against those fraudsters that she mistakenly trusted to enquire on her NYSC status, which would have prolonged the search for answers to the too many questions many cynical Nigerians were asking the APC administration on the allegation against her, she decided to take this heroic action, which is somehow alien to the Nigerian political class. She has actually made herself a pioneer when it comes to doing the right thing for her country. This action is bound to earn a lot of sympathizers and admirers to her, nationally and internationally. Now, the question is who wins and who losses from this honourable action taken by Mrs Adeosun? Since it appears that there are more losers than winners (although the list is not exhaustive), let’s start the review with the losers! Kemi Adeosun had been one of the leading lights of the APC administration. She is arguably the best minister of finance Nigeria has ever had, in view of the sincerity with which she superintended the economic affairs of the country and the many reforms measures she promoted and actively implemented for attaining sustainable economic development. She was the first finance minister to come out publicly and told the world that the Nigerian economy was in a “technical recession”, a fact that was being unfairly hidden by previous occupants of that office. She then advised the government on a number of measures to take to get out of the recession. She doggedly implemented the approved measures and the country successfully exited from it in less than two years! The many unprecedented reforms she promoted in the administration, for exiting out of economic recession and for ensuring sustainable economic development, have enjoyed a lot of respects internationally. The most recent kind accolade showered on the administration was the rating made by Forbes that Nigeria is number one in Africa in terms of economic development indices. This and many other favourable ratings to come the way of Nigeria in the near future are the outcomes of the commitment and doggedness of Adeosun as minister of finance. Within three years, three months, she has institutionalised fiscal discipline in the country (making the country to be more focused on capital projects in its expenditure than on recurrent expenditure, with timely releases of funds to execute approved capital projects); enhanced non-oil revenue generation (to the extent that crude oil sale faces high competition in terms of percentage contribution to total national revenue); introduced Voluntary Assets and Incomes Declaration Scheme (VAIDS) to bring more taxpayers (especially high net worth individuals) into the tax net at both the federal and states level; promoted massive infrastructural financing through very low concessionary loan arrangements with foreign investors (for rails, roads, waterways, airports, housing, etc constructions); and promoted the development of micro, small and medium scale enterprises (through the establishment of Development Bank of Nigeria, which provides MSMEs with accessible loans). Other areas where her legacies could be seen are: (i) Establishment of Efficiency Unit (to ensure that all government expenditures are necessary and represent the best possible value for money). With its establishment, the federal government saves at least N15 billion annually from the services of the Unit. (ii) Introduction of Presidential Initiative on Continuous Audit (PICA) to ensure full accountability of all public funds expended under the APC administration and to get rid of “Ghost Workers” in the payroll. (iii) Development of Whistle Blower Policy, which empowers citizens to report public corruption. As at July 2017, over 2,500 financial crimes reports have been made through various reporting channels with 365 being actionable tips. The sum of N375.8 million had been paid as reward for 20 whistle blowers in the first batch payment. (iv)Treasury Single Account (TSA), through which the government monitors and manages revenue from revenue collecting and revenue generating agencies of government. The Account has so far mopped up over N3 trillion as revenue accruals since the policy commenced. All her pragmatic, energetic, scholarly, and professional displays that kept the country counting its breakthroughs in sound public finance management would be missed! Her absence would definitely be a big minus to the APC Administration. Has there ever been a finance minister that stood by the governors of the states of the federation in their difficult financial times like the resigning Adeosun? NGF Secretariat should answer this question. The resigning minister took it as a responsibility to convince the President about the need for salary bailout so that states that had huge salaries, pensions and other personnel-related bills arears could be redeemed from those liabilities, with the arrangement that, through direct deductions from their Federation Account monthly shares, the amount granted could be recouped. Only about five states have not subscribed to the Salary Bailout offer. That was how many states came out of the wage-bill liability successfully. Adeosun also midwifed the introduction of Budget Support Facility (BSF) with the 22-point Fiscal Sustainability Plan (FSP) as its string attached. The Facility (of N14.5 billion for each of the 36 states) to support states government in dealing with their budget deficits, especially on wage bills, had a grace period of one year (which was extended for another one year). The Facility was also redeemable through reduction form the states’ monthly share from the Federation Account. All the 36 states have benefitted from it. She creatively established a finance house outfit to mobilize the fund needed to cover the amount for the Facility through issuance of government bond to the Security Market. The Facility was staggered over 12 months, to ensure effective monitoring of its utilization by the State Governors. Full compliance with the 22-point Fiscal Responsibility Action Plan at the state and Local Government levels, as a back up to the Fiscal Discipline instituted at the Federal Government level, would have made Nigeria the fastest growing economy in the world and the country would have been launched as one of the developed economies of the world in the not-too-distant future! Some of the 22-point action plans are: domestication of Fiscal Responsibility Law; establishment of Efficiency Unit; adoption of the FG measures to deal with payroll fraud; publication of audited financial statements at most nine months after the accounting year-end; setting and achieving realistic targets in internally generated revenues; setting limits on personnel expenditure as a share of total budgeted expenditure. Adeosun was a staunch supporter of the claims for refunds made by the governors of all of the states of the Federation on the excess deductions made from their states’ statutory allocation to settle foreign debts owed Paris Club, London Club and other multi-lateral creditors in the past years (mainly 1995-2002). The partial refunds approved for payment by the President enriched the states governments a lot, to the extent that many of them utilized the money in executing future generation capital projects apart from using the money to settle any remnant of personnel cost liabilities. 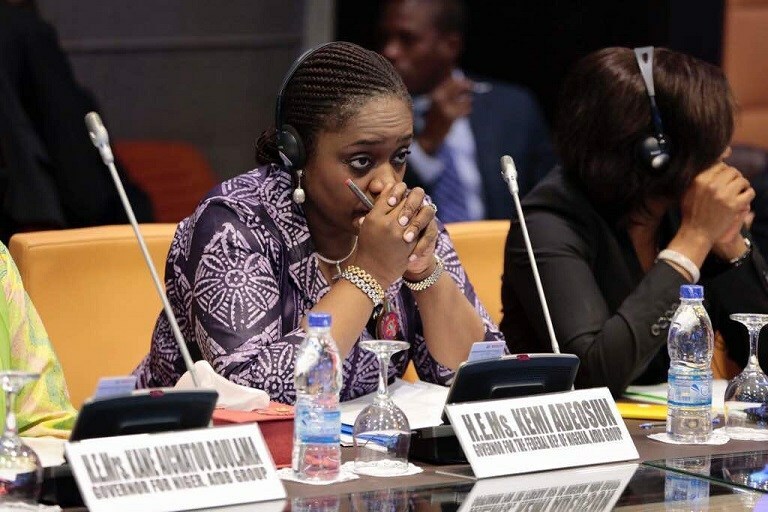 Adeosun was ever willing to assist governors in meeting up with the requirements of obtaining concessionary foreign loans for executing bankable projects in their states; she was giving them all the supports and guidance they deserve, sometimes through their Commissioners of Finance (of which this writer was one, from June 2015-October 2017). She was also assisting the governors to access Stabilization Fund, Ecological Fund, Natural Resource Development Fund, etc. What a shocking resignation! The governors might organize a valedictory meeting of their forum in honour of Adeosun, and it would be very emotional listening to them as they shower accolades on her, one after another! Members of the Federation Account Allocation Committee (FACC) made up of Commissioners of Finance, their Technical Team members (States’ Accountant Generals) and other stakeholders that attend the FAAC meeting as technical support service providers would miss their indefatigable and amiable chairperson, who usually carry everybody along, accept criticisms and suggestions and sometimes crack jokes to make the meeting lively, even in times of high national financial worries. She used to be very frank and sincere with the members on issues related to the workings of the committee and her ministry, a sort of no-skeleton-in-my-cardboard attitude! She would definitely be remembered for always insisting on the meeting to be carried on under the chairmanship of the permanent secretary of the ministry or the accountant general of the Federation, if she has any serious excuse for missing it. The news of her resignation would be a big shock to the members of this important committee. Their valedictory meeting in her honour would also be interesting to watch. But they just have to bear with her “stepping aside” and continue to wish her well! When the news of her resignation first filtered out, sources from the Ministry of Finance denied it until when she made it public herself before the staff in the ministry, and its parastatals started absorbing the shock of the news in their different ways. Friday, 14th September, 2018 was actually a day of mourning and shock-absorbing in that ministry, being the day Adeosun made her last appearance there as a minister. The staff in the headquarters and those at the various offices of the ministry’s agencies: Treasury House (Office of the AGF), Federal Inland Revenue Service (FIRS), Nigeria Customs Service (NCS), Debt Management Office (DMO), etc have missed a leader, a mentor, a mother, a friend and a motivator with the resignation of Adeosun. What a loss! By Nigerian standard, a 51 year old person is taken as a youth, many even consider that person as inexperienced enough to hold a serious position in government. When Adeosun was appointed in 2015 at the age of 48 years, many cynical Nigerians were against her appointment claiming that she was too young to manage the Federal Ministry of Finance, especially as she was not made a minister of state. Some mischievous people were even recommending that somebody like Kalu I. Kalu or Ngozi Iweala should be recalled to serve! It is unfortunate that youth organisations, especially the politically-motivated Not-Too-Young-To-Run, have not come to the defence of her appointment. Adeosun was able to prove cynics wrong and do the youth proud. She has proved that with right leadership, right training, commitment and dedication and professionalism, Nigerian youth could lead the country to become one of the most developed in the world within a short period of time. As one of the most active representatives of the youth in the FEC, the Nigerian youths must consider her absence as a big loss and they have to start thinking about how to avoid the type of mistake she committed to fall into the “trap” of wicked politicians who masterminded her exit! As women clamour for position of leadership and representation in the political arena, women of integrity, hard-work and professionalism are those to champion the cause of women successfully in the democratic dispensation. With Adeosun’s rising profile and popularity, there was hope that the sky was the limit for her in the system. This temporary set-back that led to her resignation is a challenge for the Nigerian women in politics to start thinking about how to curtail its re-occurrence in the future. With women constituting just about 18% of the Federal Executive Council (FEC) membership, about 6% of the membership of the whole National Assembly (both Senate and House of Representatives) and 0% membership in many of the States Houses of Assembly, it is a big loss for womenfolk to have one of their FEC members resigning. Nigerian women in politics have to be united against the elimination strategies of the menfolk, as exhibited by the pressure to have Adeosun resigns her position, with many women following the bandwagon of the pressure group ignorantly. With the likes of Adeosun in politics, Nigerian women may not have to rely on any dimension of affirmative action, from the dominant menfolk, for them to attain to various positions of authority. For now they have fallen prey in the hands of the mischievous political manipulators and, so, they have become losers this time around, they should not be easy losers again! As a professional accountant by training and inclination, Adeosun had been a great ambassador of the profession right from when she served as a commissioner for finance in Ogun State (2011-2015) where she increased the Internally Generated Revenue (IGR) of the state by 500% and won a professional tussle on the residency provision of PITA against the mighty Lagos State. This gave Ogun State the right to collect the PAYE of about 100, 000 employees that were residing in Ogun State but working in Lagos State. She served meritoriously at the state level, defending the integrity and accuracy of her dear Institute (ICAN), the Accountancy profession and professionalism generally. That spirit of professionalism was extended to the Federal level, with an excellent scorecard to show for every professional to be proud of. All the issues heighted under (1) above were motivated and propelled by the professionalism in her. As she has bowed out, are ICAN, ICAEW and other professional bodies not hurt by her absence? By now, they must have started counting their too many losses! The story of Adeosun’s resignation is a big lesson for Nigerians in Diaspora who might wish to come back home to serve. There are many “traps” set by the envious Nigerian politicians who are all out to cripple the home-coming Diasporas whom they think have accumulated knowledge, wealth and international connections to triumph over them when it comes to political contest to acquire power and influence at various levels of governance. Adeosun’s “capture” into their “trap” is suggesting that home-coming Diaspora must be careful about who they deal with in Nigeria, especially as one philosopher says: “inside every person you know, there is a person you don’t know”. Returnees have to be careful about the advice they solicit or receive from those they feel they know or trust. Some of us that have been Diasporas for sometimes have suffered one disappointment or another on coming back home to serve (this writer was a professor in a Malaysian university for two years). But Nigerians in Diaspora have to take Adeosun’s case as a bigger lesson to learn when dealing with Nigerian politicians, businessmen/women, civil servants, NGOs, etc. Nigerians in Diaspora are apparent losers here, as one of their own is affected, but they should not be innocent losers again! As the only minister representing Ogun State, South Western Nigeria, the state and the whole region should be seen as big losers as Adeosun resigns from her lucrative position, based purely on principle. Although she had never given any impression that her position was for Ogun State or the Southwest zone alone, her breakthroughs in nation’s building and in ensuring sustainable economic development of Nigeria must have been a source of delight to the good people of Ogun State and the South West in general. With her resignation, they have to stop counting her scores of breakthroughs in that office, hoping that a door for a bigger office would soon open for her to occupy and serve humanity better. Although they are losers, but they have no cause for regret in view of her unprecedented records of achievements while serving her fatherland as minister of finance. They should be earnestly proud of her! With the professionalism in her and the growing profile and popularity she was gathering nationally and internationally, Adeosun must have been a threat to some influential members of the FEC and must have stepped on the shoes of some powerful individuals inside the government. These insiders, who are variously called “kitchen cabinet” members or “cabals” could be very ruthless in dealing with any hardworking, honest and independent-minded functionary that is not ready to act their script. There are unconfirmed stories that Adeosun was strongly opposed to paying about $17 million consultancy fee to some lawyers who claimed to be the consultants that facilitated the release of $322 million by the Switzerland government to the Nigerian government as part of the Abacha loots in that country, with the agreement that the money is to be shared to the poorest of the poor in Nigeria. The consultants making the claim enjoyed the backing of some powerful ministers in the administration, but Adeosun vehemently refused to oblige them, since the amount was obtained based on direct government-to-government agreement. Making a simple arithmetic, $17 million is about N6 billion. If N1 million is to be granted per person as capital, 6, 000 millionaires from the 36 states of the Federation would be produced overnight by the government, using the money unjustifiably claimed by the two lawyers and their “cabal” supporters. If N500, 000 is to be shared per person as capital, 12, 000 Nigerians from the 36 states of the Federation would benefit from the recovered looted amount, and if government is to share N100, 000 per person, 6 million Nigerians would get capital to start or expand various businesses, trades or vocations! If we are to go by the government policy of giving N5, 000 to each identified poorest of the poor in the Nigerian society, a total of 1, 200, 000 people would benefit from the amount, which Adeosun denied those greedy “cabal” and the so-called consultants. There are many other ethically good stories like this about her relationship with some money-mongers in the administration. Such stubbornness, which is legally and ethical required for ensuring probity and accountability, would never go down well with the ruthless power-brokers. As Adeosun honourably bowed out of Office, those people would throw a big party to celebrate her ouster. Back home, there were indications, right from the onset, that many bigwig politicians were not happy that Adeosun was chosen as minister from Ogun State instead of them. Why would somebody that had been in diaspora for about 34 years, relatively very young in age, inexperience in the state’s politics and brand new to the dirty waters of Nigerian politics be preferred to us, they might be internally asking themselves. They must have quickly set some traps for her, hoping that she would fall into some of them, so that they could easily nail her when her profile starts rising. This envious group of politicians exists across the country and they could be very dangerous and wicked. One of the traps they set for Adeosun was the NYSC status enquiry, on which they promised to assist her to enquire and then do all the running around for her to get a satisfactory result quickly and easily. The fake certificate, that would be haunting her over the years, was developed as a good sword, and its sharpness was planned to be used when her profile tends to be flying too high to the extent that her loyalty becomes questionable or divided! This PhD (Pull her/him Down) political manoeuvre is mischievously being applied on all new comers to political class. The trap setters are always proud that their strategies never fail! Now they must be thanking whatever they worship as their “God” for masterminding Adeosun’s resignation as a minister. But the good thing is that they don’t celebrate openly, their parties are always in the night, at their shrine! Many of the reforms measures Adeosun brought into the APC Administration and doggedly implemented by her, as the chief financial adviser of the government, have set her up against some powerful economic saboteurs, who are used to looting the treasury of the country dry and evading payment of various classes of taxes. The establishment of Efficiency Unit, the introduction of Whistle blower policy, the introduction of Treasury Single Account and the introduction of VAIDS are reform measures that many government functionaries and many business moguls and their cronies in government are not happy with. Since she is the architect of all these measures they must have been looking for one way or another to get rid of her, and this issue of NYSC Exemption Certificate saga provided the long awaited opportunity. The way the social media, some print media houses, some civil society organisations and even some faith-based organisations were amplifying the issue suggested that too many interest groups were behind the deepening noise about the issue. Now that Adeosun has thrown in the towel, one might wish to see how happy these looters, tax evaders/defaulters and other economic saboteurs are, and the type of parties that they organize to celebrate her resignation. The media, especially some social media platforms, have taken the Certificate forgery allegation as a matter of warfare against the personality of Adeosun and even President Muhammadu Buhari, who failed to remove her as minister immediately they started their campaign of calumny on the allegation. It was apparent that some of the social media platforms are dominated my haters of the young lady, President Buhari himself and their party, the APC. Some sections of the print and electronic media also joined in the campaign of character assassination! The dangerous media outlets (social, print and electronic), were very vehemently criticising the APC Administration on the matter (even as investigation was ongoing by relevant government agencies). This was not surprising since their pay masters are most likely the people mentioned under 1, 2 and 3 of the Winners above, who were very eager to see the minister removed and disgraced. It is unfortunate that some Civil Society and Human Right activists were used by these dangerous media outfits to make some uncomplimentary remarks against the person of the now minister on the matter. Now that it is clear that the minister was just a victim of a trap set for her by the associates she trusted on securing the certificate she was qualified to obtain without any lobby, gratification or involvement of agents, those activists must be regretting that they were ignorantly used to attack an innocent and trustworthy person. Eventually, she was not removed, she resigned! For the mischievous sections of the Nigerian media and their sponsors, it would be celebration galore, even as Adeosun voluntarily resigned from her position. This being the case, are those dangerous media actors permanent or temporary winners? The two quoted sentences above are enough personification of the moral sense of right and wrong and they clearly show that Mrs Adeosun is a woman of conscience, and that her conscience is the most important winner in the whole story! This writer and other well-wishers of Adeosun have been proven right that the minister has been and would continue to be a woman of integrity, principles and professionalism, and that she has not masterminded the collection of the forged certificate handed over to her to prove her status on NYSC, having returned fresh from abroad to serve her fatherland. We shall also continue to be proud of her as the best Nigerian finance minister to occupy that office, for her sense of courage to expose the technical economic recession bedevilling the country over many years and for finding ways to exit it so that the country was launched on the path of attaining sustainable economic development. As age is on her side, there is hope that she would get better opportunities of serving Nigeria and humanity generally in the near future and, very hopefully, her achievements would be much better than the successes she recorded as commissioner of finance (at the state level) and as finance minister of the Federal Republic of Nigeria. Her disappointment and the eventual resignation shall not bring to an end the culture of hard work, honesty, integrity, probity, accountability, patriotism, fearlessness and commitment to succeed among the present and future generations of Nigerians who cherish her ideals. Let’s join her conscience in celebrating her success story and in applauding her resignation, as a matter of principle, when the stakes were high!